Doctors launch fundraising challenge for their hospital! Doctors from the University Hospital of Wales are taking on an epic challenge to raise money for causes close their hearts. 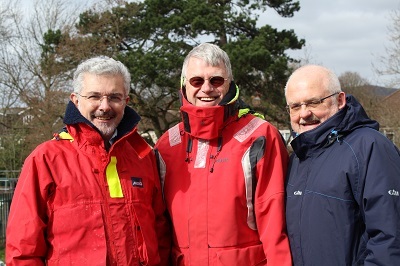 Dr Graham Shortland, Executive Medical Director and Consultant Paediatrician, Dr Richard Penketh, Obstetrician Gynaecologist and Dr John Thompson, Director of the National Poisons Information Service and Honorary Consultant will be taking part in the Eddystone Charity Sailing Pursuit in Plymouth on Saturday 15 June 2019. The Eddystone Charity Sailing Pursuit takes place every year in June, where a flotilla of boats take part in the South West’s largest sailing fundraising event, covering 26 choppy nautical miles to the Eddystone lighthouse and back. Dr Graham Shortland said: “Richard and I have previously taken part in the Eddystone Challenge over a number of years and raised nearly £5,000 for our respective charities.